This February is truly a love month not only for romantic lovers but also for the nature lovers. This weekend, we have decided to get lost at Badian. I am proud to be a true blue Cebuano as I have been raised and have lived my whole life in Cebu City. 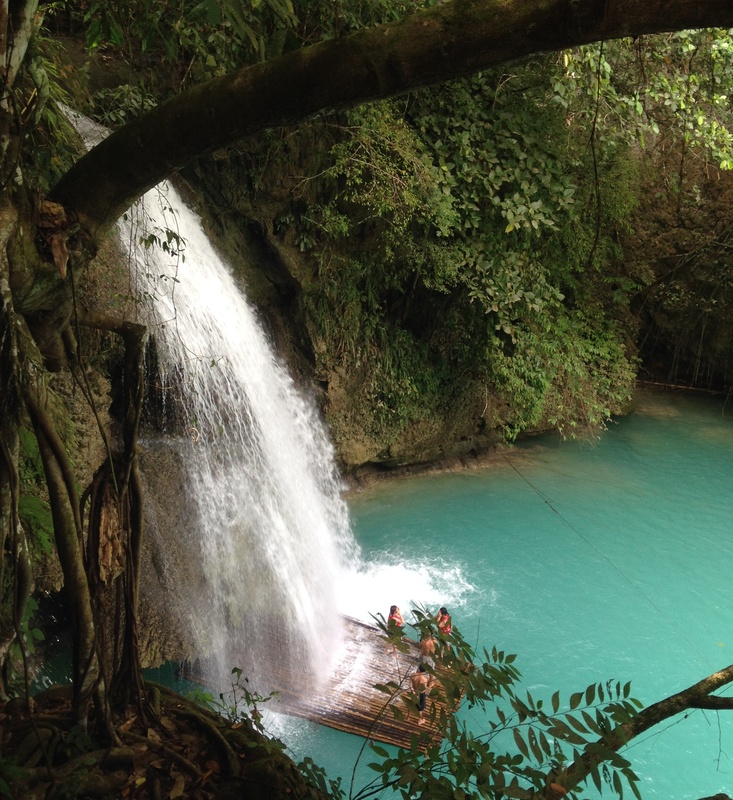 However, I've never been to Kawasan Falls. What a shame! Well, today is the day that I say "not anymore". Yeah! I said that with enough conviction and pride! LOL I have always been apprehensive in going because my friends say it's a long walk from where you leave your vehicle. It's an estimate distance of 1 kilometer. Walking under the heat of the sun with a heavy backpack is not exactly what I have in mind of a relaxing weekend. I finally convinced myself and I'm very glad I did. I did not feel it was a long walk at all. I attribute that with so many things you see along the way. I love the very clear turquoise river that you walk beside on the way to the Falls. The man-made bridges are sturdy and strong. They are not even scary at all. The way could get muddy if it's raining so better be prepared to get dirty too. I am truly amazed by the view of the Kawasan Falls. There are 3 Falls. The way to first Falls is an easy mostly-plateau walk. The way to the second Falls is a climb to the mountain. The way to the third Falls is an even steeper climb. Don't worry, though. There are steps on the way to the second and third Falls so it isn't that difficult to climb. Here's a mini Fall that you pass by on the way up to the 2nd Falls. The water is so tempting. It makes you want to forget everything and just go ahead and jump off, huh? :) Don't do that. Always keep safety a priority. Mind you, the water is cohoold (cold) too! If you plan to stay only on the 1st Falls, you may wear just slippers. If you plan to climb higher, wear aqua shoes that's comfortable and will hold you from slipping. The ground is wet and slippery. Bring light clothes, towels, and things. It's an estimate of 1km walk from the highway to the 1st Falls. You may opt not to bring food because stores and restaurants are available there. They are a bit pricey, though. If you'd rather bring your own food and drinks, there's no corkage fee. Just remember to keep it light. The breath-taking view of the Falls plus peer pressure may urge you to jump on top of Falls and be daring. Stop. Don't. Keep safety a priority at all times. If you're not a good swimmer, you can stay on the raft at all times. Otherwise, bring salbabida (life buoy). You can stay overnight, if you want. There are shelters to sleep in with a fee. It is super cold when it reaches night time. Bring your jacket. Don't forget to bring money. When you're at the site, always be mindful of your things. Don't leave your things unattended.